As I began my 100-pound weight loss journey, I prayed for a weight loss miracle. 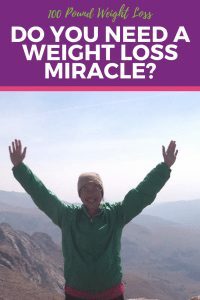 Are weight loss miracles possible? This was something I truly had to think about as I begin working hard to lose the weight. Read this story of a miracle from the Bible. As Jesus passed by, he saw a man blind from birth. And his disciples asked him, “Rabbi, who sinned, this man or his parents, that he was born blind?” Jesus answered, “It was not that this man sinned, or his parents, but that the works of God might be displayed in him. We must work the works of him who sent me while it is day; night is coming, when no one can work. As long as I am in the world, I am the light of the world.” Having said these things, he spit on the ground and made mud with the saliva. Then he anointed the man’s eyes with the mud and said to him, “Go, wash in the pool of Siloam” (which means Sent). So he went and washed and came back seeing. Jesus heard that they (the Pharisees) had cast him out, and having found him he said, “Do you believe in the Son of Man?”He answered, “And who is he, sir, that I may believe in him?” Jesus said to him, “You have seen him, and it is he who is speaking to you.” He said, “Lord, I believe,” and he worshiped him. Jesus said, “For judgment I came into this world, that those who do not see may see, and those who see may become blind.” Some of the Pharisees near him heard these things, and said to him, “Are we also blind?” Jesus said to them, “If you were blind, you would have no guilt;but now that you say, ‘We see,’ your guilt remains. When you are severely overweight, you may be grasping for anything that will help you lose the weight. Thinking there could be a weight loss miracle out there isn’t far-fetched. We all need some kind of help emotionally or physically to get the pounds off, and when you try hard with slow results, a miracle may seem like the only option. Shortly after my first daughter Rebekah was born, I told a friend I started the Weight Watchers program. On the outside it appeared I was simply a new mom attempting to lose pregnancy weight, but I had been battling food issues from the time I was young. During this conversation, my friend confided to me that when she was in college, she struggled with bulimia. She would binge on huge amounts of food and then find a bathroom tucked away in a remote area of campus to throw up. Then a pastor prayed over her and miraculously God immediately healed her. She never again had the desire to engage in this unhealthy behavior. Although it’s been close to 20 years ago since we had that conversation, I vividly remember the red-jealous haze clouding my vision as she shared her experience. Our conversation stirred in me an emotional mixture of last-ditch hope and defeated desperation. I had been begging God for years to take away my obsessions with food and provide me with a weight loss miracle. I remember praying for God to help me lose weight as a child in elementary school, asking God’s help with diets and calorie counting in high school, and begging God to please help me with this never-ending problem in my adult years. Where is My Weight Loss Miracle? Where was my miraculous healing? Where was my weight loss miracle? Why was my friend healed instantly and I wasn’t? I do not know the answer to my questions now as I did not know them then. God is God and I am not Him. The questions of why God chooses to heal some people and not others are loaded and painful. Addictions are also tricky monsters to wrap our understandings around. Is it a disease from which to be healed or a sin to be forgiven? Well…yes, yes it is. You may want to also read these Christian weight loss tips that deal some with the struggles of staying on track with faith and health. Does God Provide Weight Loss Miracles? Jesus provides miraculous healing for both addictions and diseases. Compassion does not mean saying the behavior is okay. Please understand I am not sharing my past (and some continual) behaviors with food because I’m proud they happened. 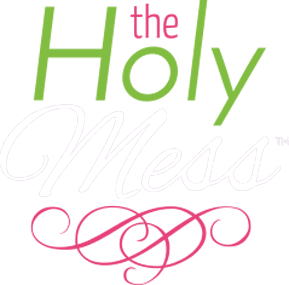 I have overcome bucket loads of shame, guilt, embarrassment, and self-loathing. Every time I stand in front of an audience and say “I was a compulsive overeater and I used to binge on 2,000 calories of ice cream in one sitting,” or each time I write a blog post that says “I used to weigh 100 pounds more than I do now and I hid my eating behaviors from my husband,” there is a part of me that wants to run home and hide under the covers for half a day indulging in a vulnerability hangover. Sometimes I do run home and hide. I don’t have all the answers regarding weight loss miracles, but I do know these things are true. The Bible is true and God reveals Himself to me there. God gives me promises I cling to. There is a whole lot of stuff about life I do not understand, but I hold on tight to what I know to be true. I don’t need to have all the answers. God loves me. God forgives me. Jesus is my Savior. I have been healed of my food addiction and compulsive overeating. Friends, just being able to type that sentence is such an all-out, amazing miracle that I want to shout it from the Colorado mountain tops! This is a seriously huge Yeah-God, Praise God, thank you, thank you Jesus moment! There were so many dark, very dark days when I did not think I would ever in my whole entire life be able to say that. I have tears in my eyes typing right now. I am here now to tell you: it happened and is still happening. 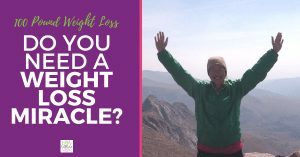 My weight loss miracle included years of therapy (6 years of going on a regular basis), the Weight Watchers online program, a lot of exercise, a helpful medical doctor, a couple good books and an in-depth Bible study. My weight loss miracle was the tortoise method. There was no quick fix or instant cure. But IT DID HAPPEN. 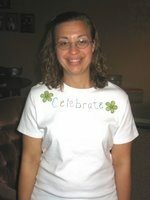 Sara “before” 100 pound weight loss. Sara “After” 100 pound weight loss. Today, I’m 10 years into maintaining a 100 pound weight loss. I’m not a super-fit all-muscle guru. I’m still slightly overweight. I’m cool with it. I work out almost every day, but I don’t go crazy with it. I eat healthily but I’m not obsessed with clean eating. I eat junk food. (I love ice cream and eat it almost every day.) I don’t carry special foods around with me or write down what I eat. I don’t obsess about what my body looks like. God is using my story to help other people now. I speak to audiences. I write. 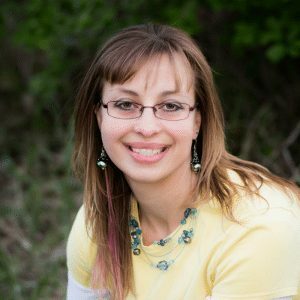 I run Faithful Finish Lines, an online Christian weight loss program for women. God did not want my unhealthy behaviors or my pain but I believe He is directing my life and using each step for His good and His glory. He is amazingly taking my brokenness and not only making it whole but creating a beautiful work. 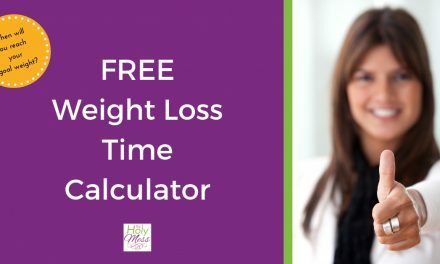 What are your beliefs about weight loss miracles? Where are you in your own process (about eating issues or some other topic)? Share your thoughts in the comments. NextWill You Improve Your Decision Making? Thank you so much for sharing your story. I struggle with binge eating addiction and it is so hard to overcome. It is very encouraging to read your story and gives me hope that maybe one day I can eat normally too. Thank you! I just reread this post and your comment about being normal about food. This is where I’m struggling. What is normal anyway? (Just typing this honest thought kinda scares me!) ? Kerri, you are right when you say what is normal. There is no normal! I guess maybe I could say, “typical”. But even that…still, when I was heavy I longed for a day when I could be healthy around food, and I prayed for it every day. I thought it would never come. I write about this now to give other people HOPE. It is possible and it will come as you continue to toward toward it. I believe God desires for us to be whole and healed, and does not want us to be trapped in addictions. Peace and hugs to you! Thank you for sharing your journey, Sara. God, indeed, finds ways to make our pain something beautiful and of service to other people. May he continue to lead you in your journey. Thank you for writing. May God continue to providing healing to your daughter and peace to you and your family. I believe He made the process a struggle so you could help others. You were made to help others and understand their pain. I hear what you are saying, Shelley. I’m not sure I would say God made the process a struggle (I think it was *me* who made the process a struggle!) but I totally believe God is using it to help other people now, and I am thankful for that! I do think I needed the long, slow route to learn everything I needed to learn along the way, not just about weight loss but about growing as a person.